Amee Yost is proud to be a Nebraska native, born and raised in Omaha. She currently works as the founder of a soon-to-be-named coaching company that helps clients downsize and declutter. Amee blogs about simplicity, decluttering, and community development on Medium. Outside of this, Amee spends much of her time as a mom to two busy grade school aged kids. She is the wife of an entrepreneur who currently operates two startups, Method Mark & Populus. Amee has a passion to serve her neighborhood, friends, and church by building community. During this episode, Amee and I discuss the challenges of being married to an entrepreneur and how she stays healthy under pressure through the ups and downs. You can check out her advice for entrepreneurial families here or listen to her husband’s episode here. Connect with Amber on Twitter and Instagram. Connect with Ben on Twitter and Instagram. Jill Moline started working in her parent’s grocery store in 1979. While following her husband, Brad’s career changes, she worked for the Lenexa, KS Chamber of Commerce, sold office supplies in Kansas City, and was a member of an artist cooperative in KC until returning to her favorite job as a grocery checker. In 2002, Jill and her husband returned to Imperial, Nebraska and Jill purchased her parent’s business. Today Jill is the owner and operator of Canopy Street Market in Lincoln, Nebraska which opened in August of 2018. Most recently, Jill was awarded the Trailblazer Award from the Downtown Lincoln Association. During this conversation, Jill and I spoke about how she stays healthy under pressure managing multiple grocery stores and how she and her husband balance work and marriage. You can connect with Canopy Street Market on Facebook and Instagram. Rosanne is an internationally recognized nutrition expert and author with a passion for facts. She helps consumers turn confusion into clarity, and mistrust into confidence. A researcher and writer at heart, Rosanne created her blog, Chew the Facts© , to help consumers decipher nutrition fact from myth, so they can relax and enjoy eating for better health. Rosanne founded Rust Nutrition Services, providing nutrition communications consulting to the food industry and science-based-medicine organizations. She is the co-author of several books in the For Dummies® consumer series including DASH Diet For Dummies®, The Glycemic Index Cookbook for Dummies® and The Calorie Counter Journal For Dummies®. You can follow Roseanne on Twitter or connect with her on linkedin. Devon Seacrest started his first business at the ripe age of 13 which was focused on creating clothing for Beanie Babies in the 90’s. Today he is the co-founder and President of Scoutsheet, a software tool that uses relationship mapping for sales prospecting. During this episode, Devon and I spoke about his career journey and how he stays healthy under pressure by establishing good routines which include physical activity, meditation, healthy eating and spending time with his son. We also spoke about the difference between advice and data and why it’s important to not compare yourself or your business to others. You can connect with Devon on linkedin. Please subscribe to the podcast, follow Healthy Under Pressure on Instagram and like us on Facebook. This week is Mental Health Awareness Week and Wednesday, October 10th is World Mental Health Day. This episode takes a look back at how some of our favorite guests stay healthy under pressure and what we’ve learned because of hosting this podcast. Please subscribe to the podcast, follow Healthy Under Pressure on Instagram and like us on Facebook. Special thanks to the Calorie Control Council for sponsoring this episode. All opinions are my own. Registered Dietitian Nutritionist Robyn Flipse is the founder of Nutrition Communication Services, a business she established in 2001 to provide a fresh perspective to the rapidly expanding coverage of food, nutrition and diet news in the world today. Robyn’s expert opinions and commentary have been featured in national broadcasts on ABC-News, Dateline NBC and FOX News Channel and in publications including The New York Times, The Washington Post and USA Today. She brings to the position over 40 years of experience as a counselor, teacher, writer and media spokesperson in addition to her credentials as a cultural anthropologist. Robyn graduated from Florida State University with a Bachelor of Science degree in dietetics, then went on to earn a Master of Science degree in human nutrition and dietetics and a Master of Arts degree in cultural anthropology from Rutgers – The State University of New Jersey. Her areas of expertise include the cultural forces shaping food fads and diet cults, the science behind no and low calorie sweeteners and their impact on health and weight management, and agricultural innovations to meet growing global food needs. During this episode, Robyn and I spoke about how she stumbled into the world of entrepreneurship and how she stays healthy under pressure by networking and giving back through volunteering. You can connect with Robyn on Twitter and Instagram. Matt Secoske was 12 years old when he got his first computer. After breaking and reinstalling the operating system, he was addicted to solving technical problems. 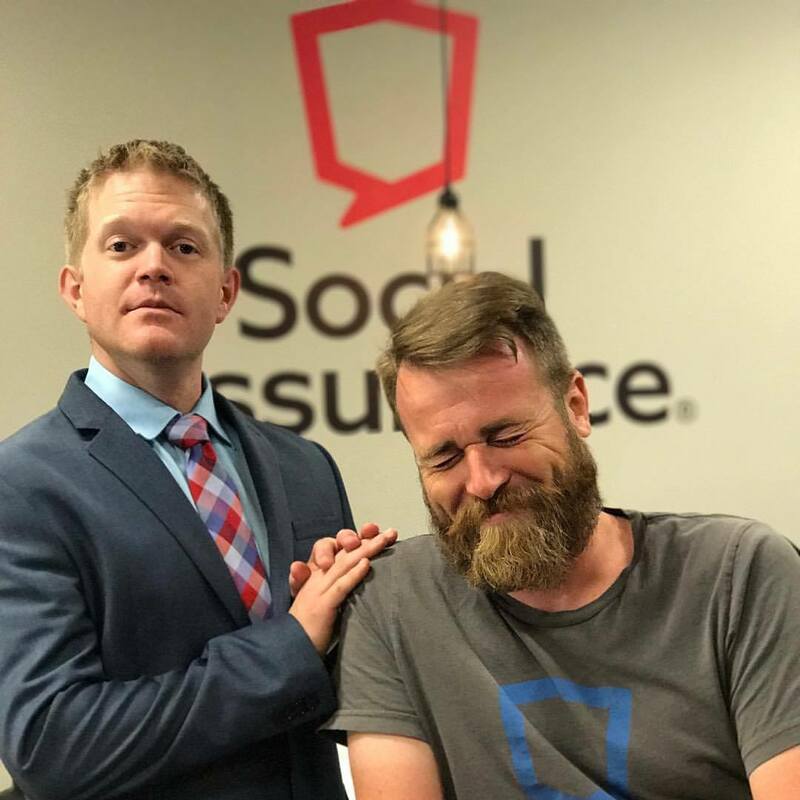 Today Matt is the co-founder of Social Assurance and the architect of the Social Assurance platform. He has extensive experience in payment processing transaction systems with ACI and has served as the lead architect for healthcare software systems. During this episode, I spoke with Matt about how launching a startup impacted his health and why he decided it was time to make a change. I also spoke with Matt about how he met his business partner and how they have been able to overcome difficult personal and business challenges. You can connect with Matt on Twitter or connect with him on linkedin. When most high schoolers were out with their friends, Brett Byman was busy cleaning bathrooms along the interstate with his parents. Raised by entrepreneurs, Brett had a very realistic view of what entrepreneurship looked like and what it means to run your own business. And when most of his friends were looking for jobs after college, Brett found himself creating jobs as the CEO of Nobl Health. Today Brett is the co-founder and COO of BasicBlock, a transportation marketplace that leverages smart contracts on the blockchain to provide trust between all stakeholders. During this episode, Brett and I spoke about how stress impacts performance and how reading, good nutrition and getting outside helps him stay healthy under pressure. You can connect with Brett on Twitter or Linkedin. Registered dietitian nutritionist, Liz Weiss, MS, RDN, has been passionate about healthy food and family nutrition for well over two decades. Helping families discover the joy of wholesome and delicious food is not just her job—it’s her mission. As the mother of two grown children, Liz advocates a real food approach to feeding families. Liz is the voice behind the family food podcast and blog, Liz’s Healthy Table. She has written several cookbooks including No White with Dinner, The Moms’ Guide to Meal Makeovers, and the playful new coloring e-book series, Color, Cook, Eat! Liz is a contributor to Today’s Dietitian RDLounge, and she brings more than 25 years of professional speaking experience to the podium for both the public and health professional audiences. Liz was a producer and reporter for CNN’s Nutrition News unit from 1987 to 1992 and is best known for her recent work as the cofounder of the online platform, Meal Makeover Moms. She is a member of the Academy of Nutrition and Dietetics and two of their practices groups: Food & Culinary Professionals and Nutrition Entrepreneurs. Liz lives in New England with her family. Be sure to like Liz’s Healthy Table on Facebook, follow her on Twitter, and follow her on Instagram. Keith Fix started his first business when he was in third grade selling erasers for 5 cents. Today he is the co-founder and CEO of Retail Aware. During this conversation, Keith and I talked about his entrepreneurial journey and the physical and emotional challenges that arise when you launch and sell a business. In a recent medium post, Keith wrote about his experience and said something had to change. You can read Keith’s medium post HERE and be sure to connect with him on Twitter or Instagram. You can also follow Retail Aware on Twitter.